CMO Consulting Group exists to help senior leaders create competitive advantage by delivering superior marketing strategies, building great brands and creating high performing organizations. We take an integrated, cross-functional approach, blending what we know about marketing with what we know about your industry. Our goal is to deliver outstanding results that can be sustained over time. 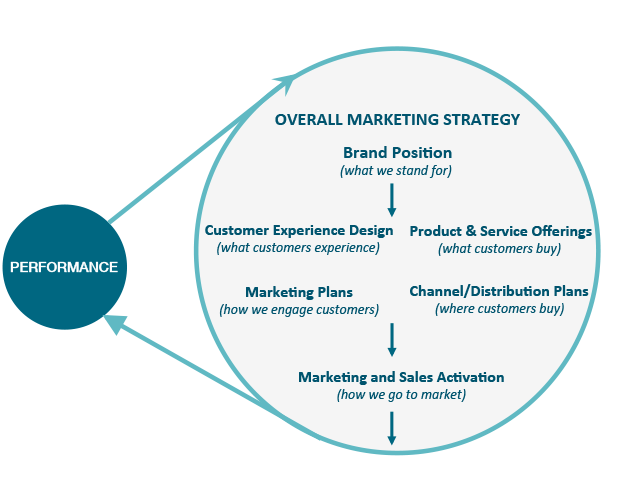 True, sustainable marketing performance requires more than just catchy campaigns or digital tactics. We believe that effective marketing starts with a fact-based, comprehensive strategy directly tied to defined business outcomes. We bring extensive operating knowledge and apply real-world, battle-tested business insights to diagnose and solve complex problems, develop marketing strategies and build organizational capabilities that will improve your business performance. Our applied experience helps us anticipate and manage obstacles, allowing us to draw from a comprehensive system of tools and methods needed to help accomplish your goals. Our approach is thorough. We define and prioritize customer and business segments, identify competitive whitespace, and evaluate customer demand creation and loyalty strategies. We audit your past marketing investments and identify opportunities for improvement. And we work collaboratively to develop new capabilities and strategies—all designed to generate profitable growth. We’ve developed comprehensive, proven systems to diagnose and address a wide range of Marketing Performance Opportunities. Disciplined strategic marketing always starts with clear intent, and drives toward specific measureable brand, customer, and business outcomes. Data without insight and decision-making impact wastes time, money and opportunity. That’s why we deploy proven and innovative qualitative and quantitative research methods to help you gain market, competitive, customer and prospect understanding. Then we put that understanding to work for you. We deliver insights that will help you create and improve marketing strategies, product offerings and services, customer experiences and marketing communications. Our approach is geared to providing maximum value and impact to our clients with simple, transparent project pricing and quick turnaround. CMO Consulting Group’s talented research team—each with at least 10 years’ experience—can provide everything from advanced analytics such as conjoint, MaxDiff and TURF to innovative research techniques such as facial coding and eye tracking. Every situation is unique but we have one goal in common—to deliver insight that creates competitive advantage. CMO Consulting Group was asked by the CEO of a $500M company to evaluate the efficiency of their existing marketing efforts and recommend changes. Sustainable growth provides fuel for future profits, but it can be tough to grow existing businesses in already-competitive markets, and even tougher to decide where to focus and develop strategies for new ventures. Markets change, technologies change, customer needs change and even your own capabilities change over time, so growth strategies require constant oversight. We believe that sustainable growth requires focus on both performance and capabilities, so we’ll help you objectively appraise the potency of your company’s Mission and Vision and provide guidance on whether to revise or stay the course. We’ll assess and prioritize market growth opportunities and evaluate options to drive innovation. We’ll evaluate your current capabilities against potential opportunities, to identify required investments and potential vulnerabilities. Our goal is to help you succeed with innovation where others fail. In 2014, CMO Consulting Group was asked by the CEO of a financial technology firm to develop a company vision, long-term competitive market position, and growth strategy. While frequently touted, the role and value of a brand is still not universally understood, and is sometimes even reduced to superficial ’branding campaigns.’ We see your brands as a core element of your overall business strategy and as a key means of differentiating your company. Your company brand should clearly reflect your core values and define your relationship with customers, creating a blueprint for both your customer experience and employee engagement. 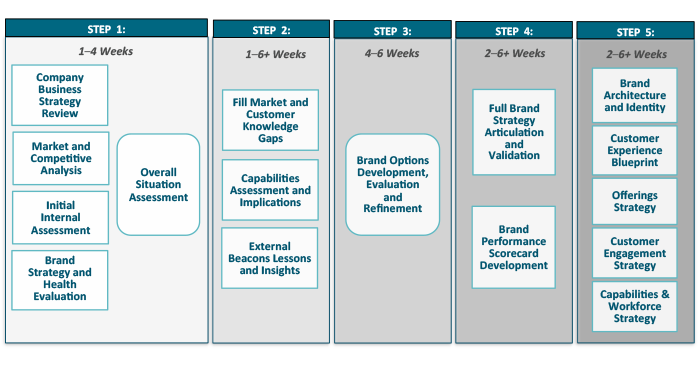 CMO Consulting Group’s approach to brand development follows five key steps, customized to fit your situation. Our comprehensive process begins with an assessment of your overarching company strategy and goals and ends with a 360o Brand Roadmap to drive activation across all customer touchpoints while inspiring employees to bring your brand to life every day. Our approach to brand development follows 5 key steps, customized to fit your situation. 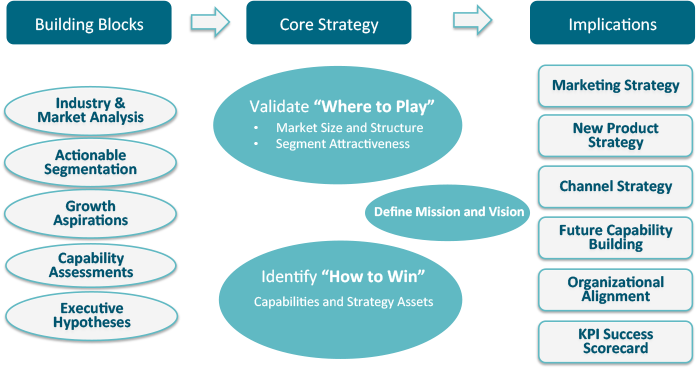 In 2013, a Fortune 500 client needed to defend against price-driven brands, and asked CMO Consulting Group to help develop and launch a fighter brand.  While it’s widely accepted that a focus on Customer Experience (CX) improves business results, far fewer understand how to operationalize and scale the effort. To deliver the holistic and personalized experiences customers expect, we work to design and implement a strategy that can exist across your entire enterprise. We make sure this approach is repeatable and adaptable, as customer needs change and platform technologies evolve. We also make sure it balances your outside-in customer needs with inside-out business results. We offer a full suite of CX services, from strategy development, design and mapping through roadmap sequencing and execution. Our applied experience gives us the expertise to meld CX design (marketing) with CX platforms (technology) and CX operations (sales and service) to successfully scale the personalized and self-optimizing experiences customers want from your brand. 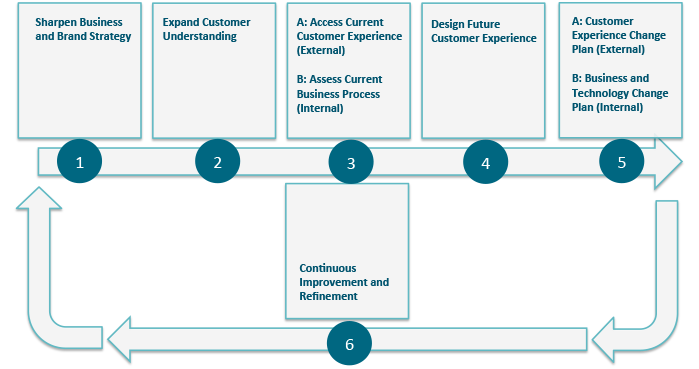 Our approach to CX follows 6 key steps, customized to fit the challenge. Our unique end-to-end process attacks strategy, design, and delivery. It’s common to see those who grew up as digital natives wrestle with classic marketing disciplines such as brand development, and just as common to see marketers with traditional backgrounds hesitant to embrace cutting-edge technology. And regardless of whether you’re a traditional or digital marketer, it’s easy to get overwhelmed with the thousands of technology platform options available today. We believe that technology should be used to enable effective marketing strategies. This philosophy requires that companies develop a close bond between IT and Marketing, forming an unbreakable alliance that is firmly embedded into your culture rather than just tasked to a project. 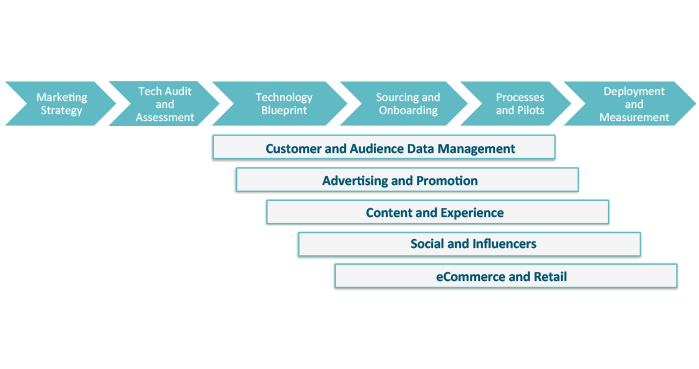 We take full advantage of marketing technology by following seven strategic steps. Our process begins with an assessment of your marketing strategy and goals, and ends with effectiveness measurement, creating a learning loop for continual improvement. This process can be comprehensive but is often used on specific trouble spots as circumstances dictate. For example, a firm experiencing attrition issues may be in need of a website redesign or content development and deployment to increase customer engagement. Assisted a major technology company in implementing a custom marketing database solution, including the use of analytics, predictive modeling and campaign management tools for B2B and B2C. While brand strategy can help define a winning customer-based reason for being, brand clarity can be a cultural lynchpin and catalyst for organizational change. We work to balance your need to drive near-term performance with the investments required to build organizational capabilities that lead to better results over time. We have the expertise necessary to efficiently assess, identify and support the development of higher-level capabilities to drive your organization’s effectiveness. We work to diagnose and address marketing performance opportunities while considering organizational structure, talent, strategic partners, infrastructure and systems, work-flow and processes, governance and decision-making, as well as overall company culture. We will assess your current organization performance to identify areas of strength and opportunity. And we’ll develop a roadmap for improvement while addressing key opportunity areas, such as process engineering, agency relationships, technology partner sourcing and others. 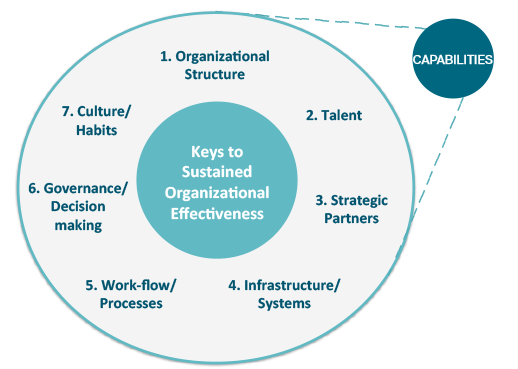 We take an integrated 360 view of organizational capabilities, assessing performance, needs and opportunities across 7 key dimensions. CMO Consulting Group was asked by the CEO and CMO at a Fortune 500 client to help assess, update and strengthen the roster of agencies supporting the company’s marketing efforts.